I woke up this morning with the intent of having a stress-free Easter dinner. Usually, my holiday kitchen looks like a bomb went off in it -- a testament to my "on the fly" cooking style. But not today. A prime rib roast dusted with Penzey's English Prime Rib Roast seasoning and some asparagus tossed in a little olive oil and garlic are destined for the grill. No mess there. And the polenta for polenta cakes with sauted mushrooms was something I could make in the morning, spread out in a pan to cool, and cut later on. Easy peasy. I had coarse-ground polenta in my pantry because of Harold. Harold is married to my BFF Coleen, and since he's from the South, I had enlisted him to make grits one day when they came over. Now since we're in the North, Harold finds good coarse-ground grits hard to find. We were walking around the grocery store, and Harold was not finding what he wanted. We saw only instant grits -- blech. Coleen was insisting we go to Whole Foods, but I was resistant since I don't like to pay Whole Foods prices. I said, "What about polenta? I'm pretty sure it's the same as grts. They're both cornmeal." Harold was doubtful, but a quick stroll to the organic aisle turned up some Bob's Red Mill "Corn Grits Also Known as Polenta." Yup, that's what it said on the package. In any case, I was making grits also known as polenta for the second time of my life. My daughter was stirring and stirring the polenta, watching it simmer to a creamy texture. She kept saying, "Mmm, that looks so good." We decided to steal some and eat it with bacon bits and scallions. Yummy! I'm sure it would also be lovely with fresh fruit, a little additional hot milk,and a little sugar or syrup. After our morning polenta-making session and eating-polenta-for-breakfast detour, my kitchen looks like a bomb went off in it. A polenta-crusted pot and skillet filled with bacon grease sits on top of the spattered stovetop. Scallions lay on top of a cutting board. Oh well. Bring liquid to a boil and slowly whisk in the cornmeal. 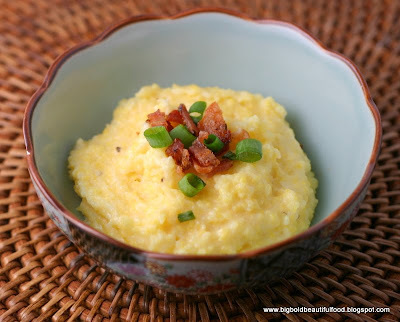 Turn down to a very low simmer and cook for 30 minutes until polenta/grits are thick. Serve immediately with toppings. Pour any remainder into a bowl or pan, as it will set up fairly quickly. You can cut it, make polenta cakes, and pan fry it later. Looks like the perfect dish to wake up to for Easter! Hope you and your family had a good one! happy easter!! prime rib and polenta for easter sounds great! 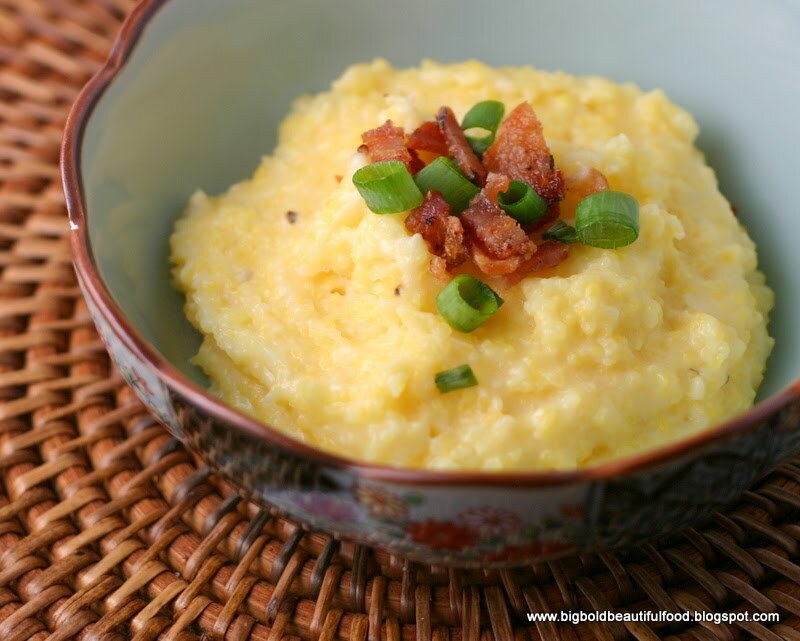 I love grits. I used to eat them with butter and brown sugar. I'm sure this would be great with butter and a little cheese. this post makes me hungry now!